As an alternative to traditional guest beds or sofa beds, we stock a range of folding beds – as you'd expect we have the best priced fold up beds on the World Wide Web. The range of folding beds includes three sizes with the full size folding bed that has a sleeping area of over 6 foot. 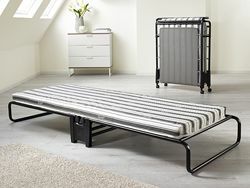 All Folding Beds come on a beech sprung slatted base and have a foam and polyester futon style mattress. Single and small double folding beds are available with memory foam or pocket spring mattresses to provide practical but comfortable support to guests and visitors. Order your folding bed online for free delivery to your door.